This 2-hour guided walking tour of Los Angeles' spookiest places will satisfy mystery lovers, ghost hunters, and followers of cold cases. Follow your guide along a trail of haunted hotels, historic massacres, bombings, underground tunnels, and true crimes that have never been explained. Starting at the haunted Pico Hotel and ending at Pershing Square, this nighttime tour is not for the faint of heart. Peek underneath the sunny allure of the City of Angeles into its dark side. 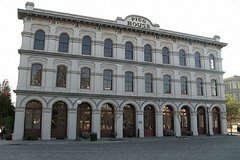 Meet your guide at 6:30pm in front of Pico House just across the street from Union Station. For two hours, you'll walk through some of Los Angeles' spookiest sites as your guide recounts true stories of unsolved murders and ongoing mysteries. Are the footsteps and voices heard in Pico House the ghosts of Pio Pico, the last Mexican governor of California, who built the hotel? Or are they the cries of the immigrants killed nearby during the Chinatown Massacre of 1871? Does Rudolf Valentino still haunt his old suite at the Alexandria Hotel? Walk the underground pedestrian tunnels beneath Civic Center, learn about the bomb that leveled the L.A. Times building in 1910 and killed 21 people, and ponder what is perhaps the city's oldest cold case: the infamous 1947 murder of Elizabeth Short, "The Black Dahlia." The tour ends at Pershing Square Downtown.